Shruti is a noted BPM mastermind, which complements her research and manufacturing expertise. One of her most noted recent accomplishment is speedy turnaround of a struggling contract research and manufacturing company into a profitable business within nine months. She has implemented Continuous Improvement methodologies such as 5S, Lean, Kaizen, Lean six sigma, TQM, ISO, Just in time, Hoshin Kanri, Poka Yoke and more, for business processes within a variety of industrial verticals including- pharmaceuticals, packaging, biotechnology, medical devices, foods, cosmetics, bulk drugs, chemicals and intermediates. If you can't describe what's your process is, then you don't know what you are doing! 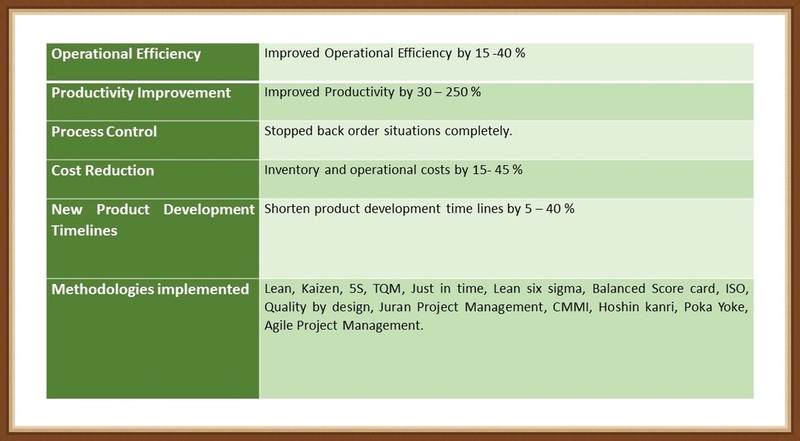 Business process improvement strategies are different for "Manufacturing" and "Service industry". In manufacturing industry "What you make is the differentiator", while in a service industry " What you do and How you do" makes all the difference! Continuous Improvement achievement dashboard. (Click image to enlarge). After all 'Process" is just a name for the work being done... isn't it? Additionally, for most companies, cost-cutting in a slow economy means across-the-board slashing that ‘spreads the pain’ of budgets reductions across many departments. Shruti believes that this approach is short term and will actually, leave a company weaker. Instead companies that need to reduce costs should treat the challenge as an opportunity, to identify and reinforce their key capabilities, while divesting those activities that do not truly reflect the business’s strength or long- term goals. Firstly identify and clearly articulate a company’s key proficiencies- not just core- competencies or skill sets, but those very few strengths that in combination define how the organization is complete. Then use this information to create the company’s ‘Unique Blue print’ for efficient and effective cost reduction. This more strategic approach will make the company more resilient as tough times continue and more robust as recovery begins. Productivity improvement with a focus on quality and innovation. Inventory management, transportation and logistics. Shorten development timelines from concept - to market. Shruti's industry foresight and knowledge is grounded in the identification of key issues that her client's company face as well as first-hand experience gained from serving clients world-wide through-out her contributions over 18 years. As industry dynamics rapidly change, Shruti helps her clients navigate these shifts and gives them the TOOLS needed to survive and thrive.